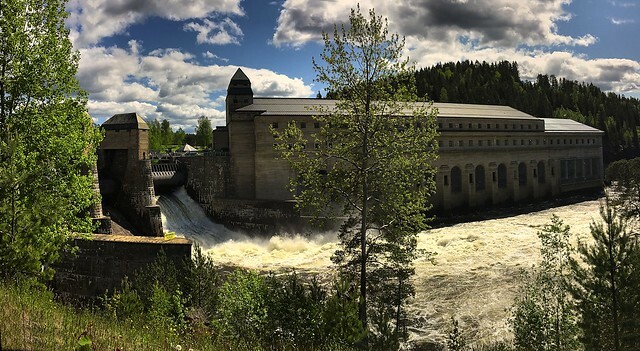 Hundreds of kilometer away from this Hydroelectric Power Plant at the river Glomma in Norway Southeast - the snow in the mountains started to melt right after the easter days up in the mountains. And then, as almost every year the flood have reached this place right in my neighboorhood on it's way to the ocean only 60 km away after a long travel from the mountains. And as we do the most years we find a fine day to bike to this power plant to have a look at the great spectacle. 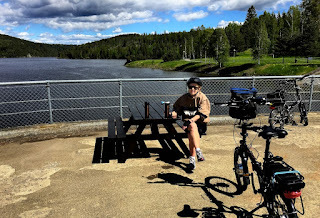 The madam takes a little rest by the Hydro electric Power Plant, some 60 km SouthEast of Oslo.